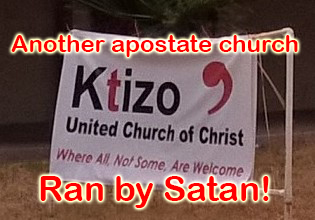 This is the third United Church of Christ in the Phoenix, AZ area that is literally ran by wicked God hating Sodomites. What is their purpose? Who are these perverts kidding besides themselves? Sadly they are mixing this up with innocent children in these wicked apostate churches. Some children brought in by the queers who adopt them or obtain them from some other unnatural means, and from those dumb enough to actually take their family to this Satanic cult! dyke, fag, homo, lesbian, lgbt, queer, united church of christ. permalink. Arizona Sodomite is upset that Russia doesn’t allow LGBT propaganda!